The San Diego County Sheriff's Department is stepping up efforts to stop impaired drivers from hitting the road this Labor Day weekend. Watch for increased DUI patrols by deputies across the county beginning on Friday, September 1st through Labor Day on Monday, September 4th. Deputies will also be holding a DUI checkpoint in the City of San Marcos on Friday, September 1st. During Labor Day weekend 2016 (Friday, September 2nd through Monday, September 5th, 2016), deputies arrested 18 drivers on suspicion of DUI across San Diego County. 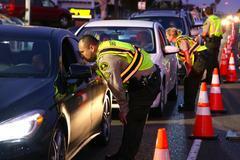 "Crashes caused by impaired drivers are 100 percent preventable," said Sheriff Bill Gore. "You will go to jail if our deputies catch you drinking and driving." Do the responsible thing: Don't Drink and Drive. If you do drink, be sure to have a designated driver ready or call a taxi or ride-sharing service. Drive Sober Or Get Pulled Over. Watch our public safety video on the high price of drinking and driving by following the Sheriff's Department on VIMEO: https://goo.gl/NsnA0a. This Labor Day weekend, be aware of San Diego County's "Social Host" ordinance. Anyone caught serving alcohol to a minor will be arrested and booked into jail. You can report underage drinking to the Sheriff's Department by calling our non-emergency line at (858) 565-5200. You can also learn more about your responsibility as a "Social Host" by visiting: www.sdsheriff.net/social-host. Funding for the Labor Day DUI patrols/checkpoint is provided by a grant from the California Office of Traffic Safety (OTS) through the National Highway Traffic Safety Administration (NHTSA).